I want to hold her again. I want to go back to that horrible day, and hold her, and never put her down. I want to tell her over and over that I love her. I want to hold her and breathe warmth and life into her cold, gray little body. I want to feel the weight of her, or lack thereof. She was so little, but that last time I held her she was heavy from the fluids pumped into her body. It wasn’t right. I want to smell her hair again, that sweet salty smell of her curl shampoo and her sweat and sunscreen all mixed together. I want to stick my fingers in her ringlets and watch them bounce. I want to have not been in shock. I felt like I had to keep it together and I don’t think I let myself soak in our last moments. I couldn’t accept they were our last moments. How could I accept that? I want to forget those images, forget that day, forget it happened at all and erase it from history, and instead just have her home with me, sleeping in the bed I picked out for her four years ago. FOUR! She’d be four in two months. Four. I want to have one more day, where I get to see her as she’d be now, instead of always being a baby in my mind and memory. I want to know what she’d be like. Who she’d be. What she’d think and say and how she’d smell. I want to talk about her all the time, but I don’t anymore. I think about her all the time. I ache for her all the time. I want her to know that I will never get over this. There is a part of me that is so happy, but there is another part of me that died that day too. And some days, that part of me weighs so heavy, but I have to hold that heavy part up or else I’ll sink below the surface. I am so tired sometimes. I am so sad. I want her. I want my family whole and intact. I want her. Heather I want you to have her with you every day. I can never fathom the loss of you glorious girl. I will never forget Maddie and I will always be so grateful that you share her with the world and that you continue to share the life of your family with us. It is such a precious and beautiful gift. Sending you love, thanks, and the hope that comfort surrounds you. Oh Heather, I am thinking of you. I don’t have children yet, and have not experienced what you have, but I am thinking of you. I wish you could hold her one more time. I wish she was still with you now. I wish words could be of comfort but I know that isn’t the truth. Nothing will ever make the hurt truly go away. Please know that you can talk about her anytime, we will listen, care and love you here. She was the most gorgeous little girl. Her smile is infectious! I wish I could give you a huge hug right now. Please know that I’m thinking of you over here in Australia. I wish I could hold my little one too. Nothing ever prepares you for their last moments with you and the constant replaying of them in our minds. Over time, I’m learning to live with my loss but it never is far from my mind. My heart aches for you right now. Sending huge hugs and warm thoughts to you. I am sending you a great big hug and lots and lots of love from afar. I so wish you could hold your precious Maddie again. I still think of your gorgeous girl every day, she holds a special place in my heart and always will. Your World Famous Maddie will never, ever be forgotten and has made such an impact of the lives of so many people all over the world. I see her smile every day and see purple everywhere I look reminding me of her. Everyday I ask for a do-over. It is all so hard. I understand. I want my little girl back, too. I want those awful memories gone and I want my family intact, just like everyone else’s seems to be. My heart hurts for you, Heather. I haven’t commented in such a long time, but this post really spoke to me. My heart hurts for you and the pain you carry with you everyday. There are no words that can change that. I want her back for you. I want all those things for you. And I wish that you and your family never had to go through this. Beautiful writing that I wish could be granted. I wish so much you could get more than one day with her. I can’t imagine your pain. I hope you don’t mind that every day when I read your blog, I visit pictures of Maddie. Her smile brings me peace. I wish you could have all the time in the world with her. It will always be so wrong that you can’t. It was nice to read a post about and see a picture of Madeline. It kind of brings her back to us, if that makes any sense. Talk about her as much and as often as you need to. It’s through the talking that we work things out…or at least make them not weigh so incredibly much. I think she knows that you miss her every day. As tears fall silently down my face….How I wish the EXACT same wish for yourself, Mike and sweet, adorable Annie! How I wish the profound love you feel for Maddie, could have breathed life right back into her frail little body that horrific day. How I wish the love we feel for YOU and MIKE, could somehow heal your broken hearts….even just a little! How I wish that horrible day Never happened, instead the day that did was filled with music, love. laughter, hugs, kisses and tickles. Just last night, when I was feeling badly, I looked at Maddie’s pictures and cried. SO unfair your beautiful baby girl is gone. Life can be so cruel Heather. You and Mike know this more than most I’m afraid and I am so sorry you do. I do hope you are able to take some solace both friends & stranger friends care so much for you and your family! I’m sorry I live so far away from you. I wish I could take you in my arms, give you a warm hug & comfort you. Please know you and your whole family will ALWAYS hold a special place in my heart. Thank you for sharing Maddie and Annie with us. I truly believe we are all better people for having known your special little girls as well as you and Mike! Thank you My Friend…Thank you. I was looking Maddie’s pictures last night. I want all of that for you too. I hurt for you. I wish all of that for you too, Heather. I’m mentally sending many, many big hugs your way. I love when you talk about Madeline. I don’t think she’s far from many of our minds. Thank you for sharing your family with all of us day after day. You my dear can make me laugh out loud some days and then make me tear up when I hold my own child and imagine the pain that you wake up to each and everyday. I vote for a do over. Sending much love to you today. I wish there was a do-over too. Sending you huge hugs. I want that for you ! I was missing my babies today as well (well everyday) but thank goodness my babies have a great playmate up there in heaven. Thinking of you and wishing you peace today. So unfair. I’m so sorry. It is the worst, most unfair, wrongest thing that you lost her. I wish you a do-over, a thousand do-overs. Life can be such a shi**y game of chance. All of your readers adore Maddie, and know that even though you and Mike carry on with your lives and write awesome, hilarious blogs and raise an awesome toddler, you carry a terrible grief that only a very few people can understand. I’m so sorry. You can talk to me about Maddie whenever you want. I’ll always listen. And I’ll always agree that this is the most awful thing, ever, that you have had to go through. But I’ll laugh at all the funny stories and smile at all the sweet ones. Wherever there is purple, it makes me think of her and smile. She is missed. My heart is broken for you, Heather. I’m so sorry. She should be here. How I wish I could give her back to you. She is so, so beautiful. My heart breaks for you over and over and over. You have made me a better mom. I cherish every minute, even the not so fabulous ones. I just never know what to say. There is nothing to say that could even lift a fraction of the pain. So I will just let you know that I am thinking of you, and that I will always be grateful for the thoughts that you share with your readers. Big, squishy hugs from South Florida. wishing you didn’t have to go through this. My daughter loves looking at her pics and talks about Maddie as if they are friends. She prays for her and says “Dear God, watch over Maddie in heaven, I hope that she’s growing and getting enough to eat. Watch over her until her mommy can be with her again.” Breaks my heart. I want all of this – and more – for you. Nothing about it is right or fair. Nothing. I’m so sorry Heather. I can hug my son longer and harder every day (and I do) but it won’t bring Maddie back and I’m so sorry. I want it for you too. I really do. Oh, Heather, I want all of that for you. I want you to have everything you want, I want you to have Maddie. Love and hugs. I don’t know if I believe in God and all that stuff. Life has made me agnostic at best, but if there’s something beyond now and here,I know that Maddie knows how very, very much you love and long for her. About the only thing I can say I do believe in is the permanence of love and if there is a beyond, she knows. All of it. I understand the wish for a do-over. I wish you had one, too. If it’s any consolation (and I’m sure it’s not) you hurt so much because you loved her that much and that intensely and that fiercely. Otherwise, you wouldn’t hurt like you do. My heart breaks for you Heather. I so wish you could have all that you want. You are in my thoughts always, even though you don’t know me, but I feel like I know you, and I understand your pain. I am always in fear that something will happen to one of my children. Growing up, I said I would never have kids just for the very reason that I could never live through the pain of something terrible happening to one of them (my brother was in a terrible car accident when I was a teen and I saw the inexplicable sorrow and grief it caused my mom, as much as she tried to guard us from it, and at the same time my church youth group leader had identical baby daughters born who only lived for 5 and 6 months due to SMA and I’m still haunted by their open casket funerals and that hollow look in their mother’s eyes.) I thought the possibility of pain just wasn’t worth the joy of having them in the first place. Well, that plan went out the window when I got pregnant at 17 and gave birth to my beautiful first born daughter. Since then my hubby and I have had 3 more children (and then my tubes tied… hehe.) My 3rd was a preemie who contracted RSV shortly after being released from the NICU and subsequently spent several weeks in the PICU on life support and struggled immensely for the first couple of years of his life with chronic lung disease and frequent hospital trips. Just like your Maddie, he wasn’t a sickly child really, he just had bad lungs. Now he’s 7 years old and strong and healthy, though he still has some setbacks from his prematurity. I know that any one of those trips back to the hospital could have ended up like your last trip with Maddie, and I feel intensely guilty and confused. Why was my little guy spared and not sweet Maddie? The world doesn’t make any sense. I know some people say silly things like “You’re so strong and brave, I could never handle this like you have.” I assume that’s not true. While I agree that your strength is inspiring, and that you have continued living and you are an amazing and dedicated mother to Annabel and wife to Mike, I know that you weren’t “chosen” to have this tragedy in your life because you’re more brave or capable of dealing with it than any other mother. You were blindsided and shocked and your sweet, beautiful daughter was taken from you and it’s not fair. It will never be fair. The world can be such a cruel place. Thank you for talking about Maddie. I think you *SHOULD* talk about her all the time. We’re all here to listen. She’s your daughter, and you’re a proud mommy. Talk about her all you can! I am so sad for you….the longing you have for her must, at times be almost unbearable for you. I am so very sad and sorry for you, for Mike, for Annie. I think you’re an absolutely amazing woman, Heather. I read your blog every day. It’s wonderful. I always hope that I’ll get to hold my son in dreams, since it can’t happen for real. May you have a wonderful dream holding both your girls tonight. My heart hurts for you guys. Sometimes wanting just doesnt satisfy. I wish this for you as well.. Sending a hug. I want you to have her back again, too. I have no words. Just sorrow. I am so sorry and I want you to have her back too. Because of you and Mike and your sharing of your lovely, amazing and beautiful daughter Maddy, I now support March of Dimes each year. I wish I had other comforting words for you, but the best I can do is support your cause. Thank you for sharing everything with us. no matter how hard i try to imagine the hurt that you are feeling….i know that my imagination doesn’t even come close. thank you for sharing your beautiful maddy with me. and, your horrible pain, as well. you’ve made me love her and i never knew her until after she was gone. you have given me a gift and i thank you for that. that little girl has a smile that has lit up some pretty down days of mine. thank you (yes, i know i said that already) for sharing your gut wrenching feelings, your happy feelings, your silly, goofy feelings. i don’t know how you do it some days. you are my hero and i can’t even articulate why. or, maybe i already did. I can’t begin to fathom the depths of loss you and Mike have had to endure . You have been able to create a wonderful life for Miss Annie and I greatlyadmire both of you . All my love to all of you, every day. I know Maddie would be beautiful, smart and funny at any age. I can see the glimmer of laughter or an inside joke in her eyes. I want all of that for you so much…It’s not fair and you so deserve a do over! She will never be forgotten and she continues to inspire us all . She is so special to me and I’ve never met her or you, but her spark was so contagious and I’ve been on this journey with you since the day that you and Mike lost her. I will remember her until my time here in this life is over. She will always will be remembered and loved by so many. Sending lots of (((HUGS))) to you today and always. Of course you do. I want that for you too. All love. I want all those things for you, too, and I am so sorry. I think about you and sweet Maddie all the time. She is so loved. That made my heart hurt. I’ve never said this to you (obviously) but when I see you all I want to do is hug you and I wonder how you breathe and do the things you do without losing it. I am sure it is difficult and that some days are easier than others but…God…I see you and think of how strong you are and how I could never be you. I could never be that capable. I am in awe of you. So, I think of you often and how you’re doing. I don’t know why I don’t ask but perhaps I should. Thinking of you. My little girl would also be 4 in just a few weeks. Can’t believe it. Hugs and prayers for you as always. My heart literally aches for you, and does each time I read a post of yours. Whether it’s a post about a new hairdo or a post like this, I still think of you as Maddie’s mom and behind my smile is a tear for your loss. My heart breaks for you. I wish she was here for you to hold and watch grow up into the gorgeous young lady she was going to be. Hugs to you, Heather. I want a do-over for you. We all wish that for you…prayers and love for you and your whole family. I wish you could have a do over as well. Its not fair, its so terribly not fair. I can’t imagine what it would be like. I feel like I would fall into a mess that I would never be able to get out of. You are so strong, that you don’t even know, because you are able to still be happy. To be a great mom. To not live in the cloud that surrounds you, that will unfortunately always be there. But you can accept it, the cloud, the sadness, the terrible loss and still have the rainbow afterwords. It’s so horribly unfair. Sending you hugs, strength and wishes for peace from across the country. Yes. I want that for you too. It’s not fair. your pain is palpable in just reading your words. tears are in my eyes. I am a mom and all I can think is “A mom should never have to be separated from her baby” it is torturous and so unfair. I wish so badly that she was still here with you, and that your family was the way it was meant to be. Love to you all! aw heather, as i was pulling up your blog today I was thinking that maybe it has gotten a little easier than in the first year, year and a half when all it did was weigh on your soul, drag you down with chains, sucking in underwater in the mud….well that is MY feeling of it. I know having Annie was probably the next best thing that could help you and mike, but then on the other side of the coin is the awful finality of it all because you will always have Annie’s milestones that have surpassed precious Maddy (or Maddie? )’s milestones. THe always knowing what she COULD be, always wondering. Just based on the blog from the beginning, she was a truly shining star. Filled with so much love to give to the world, destined to do great things. Not that losing a child isn’t the most heart-wrenching experience a person can go through–but knowing how much potential she had. I know this sounds ridiculous because I have never met her…but the photos you’ve captured say so much. SO SO SO much. I work with kids all day, 2 year olds in fact; but also work with 3 and 4 year olds. These are the parents golden years. They learn SO much, you see how smart they are, how funny they can be, the things they learn, and the absolute display of “LOOK AT ME MOMMY! I DID IT!” that excitement that she accomplished something and wants to show that to her favorite person in the world. I can only guess its things like this that would rip my heart out. BUT–the way you and mike have perserverd has astounded me. Normally when I run across a blog like this and see the horror that is going on there, I don’t stay. Death and children and destruction of families is hard to see–and especially because heather has amazing skills to be able to verbalize what she is feeling. Heather, can you please send me some of that my way? I spend countless # of therapy sessions mostly in silence because I can’t not verbalize what I want to say when I’m in that room. I want your courage. That is what keeps me coming back. Your courage. (ok annie is cute too) The fact that you got out of bed (most) every day. Maybe it was just to lay on the couch and cry, or watch tv…you still got up even though every fiber ofyour being screamed at you that THIS IS POINTLESS, you did it because some part of you knew deep down that the light that is you, is still burning, but it was buried very far deep. I have noticed over the past months that this light has been shining a little brighter and brighter. It probably will never shine at its full intensity-Maddy set up big shoes to fill. Her light shone more bright than most others. I say this as in having a large family with lots of kids, babysitting all sorts of kids, and working in a preschool of 2 year olds. Its rare to find a child who just exuded that brightness out, and it is infectious. 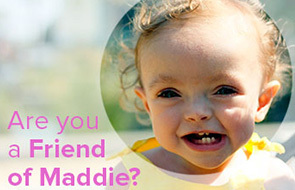 It changes peoples lives–even for the rest of that day where you got so lucky to fall under the grace of Maddie. And to think that you experiences that grace for 18 (i think?) months, it only makes sense that you would fall that much more into the darkness. But you and Mike are survivors, and in more way than one. You are a survivor because you did get out of bed (eventually), you slowly immersed yourself in the general population, you got help even if it was something you didn’t want to do. Believe me, I understand that 100%. THough it is curious to me how doctors can distinguish between grief and something more complicated. Especially when everyone grieves differently. I am feeling the same way as you, but opposite. I am child who lost her mother, and I feel all these things. Yesterday, the day you posted, was the 3rd anniversary of the loss of my mother. If I had read this yesterday I would have fallen apart again. Every day I grieve for her. I know just what you mean when you say a part of you died that day, and a part is so happy. Sometimes I feel guilty for feeling happy even when I know I’ll never forget her. Prayers and love to all your family. I ache for you… this was not fair to you. I am was a premmie too, born 3lbs 3oz in 1981. My mom says considering the lack of technology it was a miracle for me to survive. I wanted Madeline to survive to. Just know that when your looking at the world and you want to scream Maddie’s name and let the world know your in pain, we are screaming with you. I don’t one day for you or a do-over. I want you to have forever! If I had one wish, I’d give it to you. Lots of hugs with love. I don’t want. Sorry I was crying a little. You don’t know me, but I wish I could give you a hug and listen to you talk about Maddie as long as you needed or wanted to. She was such a beautiful baby, and you three seem like such a wonderful set of people, and it seems so WRONG that she’s not there anymore. My children are a part of my soul. If anything ever happened to them, those parts of me would be ghosts. I hope no one ever makes you feel like you’re supposed to be over her. I hope you never feel like you’re supposed to be over her. And I’m so sorry for your loss. Oh, sweetie, how i wish the power of our wanting those things for you too could brimg them to you, because we surely would do everything and anything to make it happen. And we all want her for you. Also, I hope this does not sound weird but: Thank You, for sharing with us your beloved daughter, Madeline. I’ll never know her, but through your words…? I’ve grown to love her. And I ache for you.